The total Nameplate for all these wind plants is 5301MW. The total Nameplate for all these 25 solar plants is 1594MW. It’s slowly coming back. Somehow, you get into a rhythm, and the work flows easily, and then you get out of the habit of doing it, and all of a sudden, it takes more time than you thought it would. I’m still taking more time than I did with these Posts, but it’s a lot quicker than it took me yesterday. I’m still striving for greater accuracy, and that has added a little time to the task, but I’m a lot happier with it now. 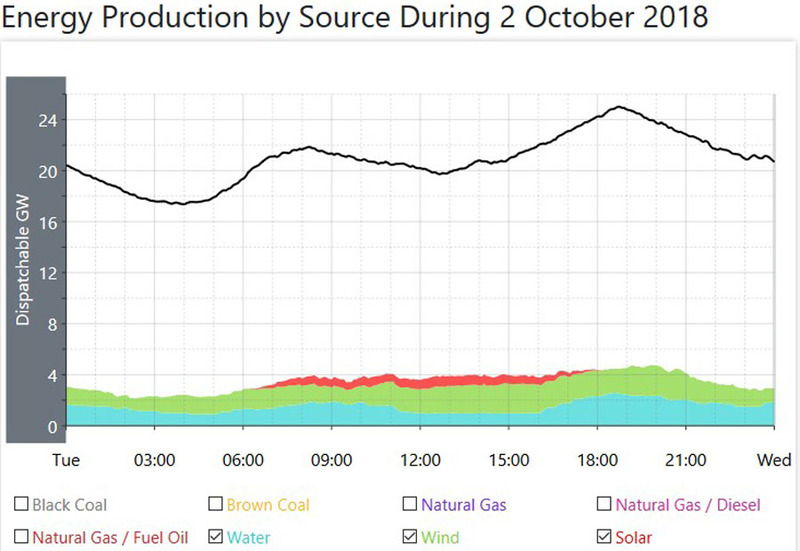 Total power consumption was higher than it was yesterday, but only marginally, around two and a half percent higher. Perhaps a fairer comparison would be to compare power consumption with a day in Mid Winter where the average hourly power consumption was around 24000MW, compared to this day when it was 21000MW, and that’s (for this day) 13 percent lower, giving you some insight into how power consumption falls in those benign Months of Spring and Autumn I mention every so often. Because those consumption levels are so much lower, those coal fired plants which make up so much of that consumed power can have some down tine for maintenance so they are in their best condition when the Summer power increases really start to kick in. 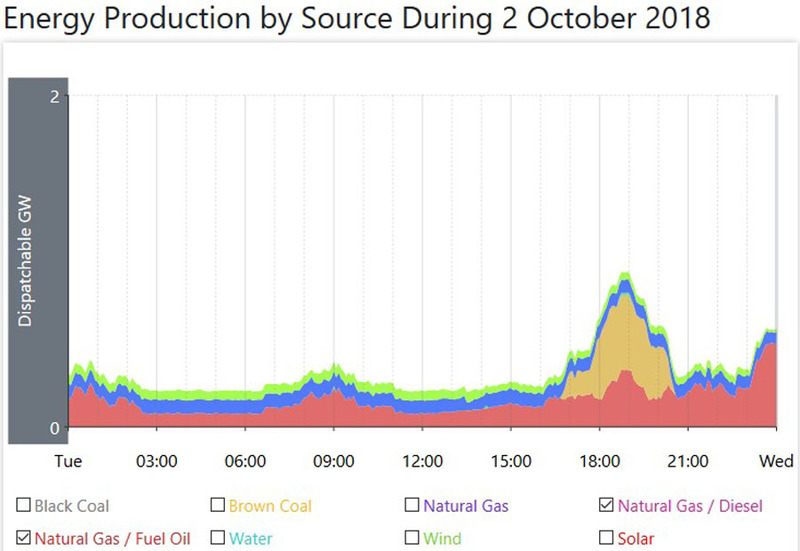 Consider that the difference between this day and the Mid Winter day of 3000MW is the equivalent of almost six to ten Units, or a greater total than the largest coal fired plant in the Country as a whole. 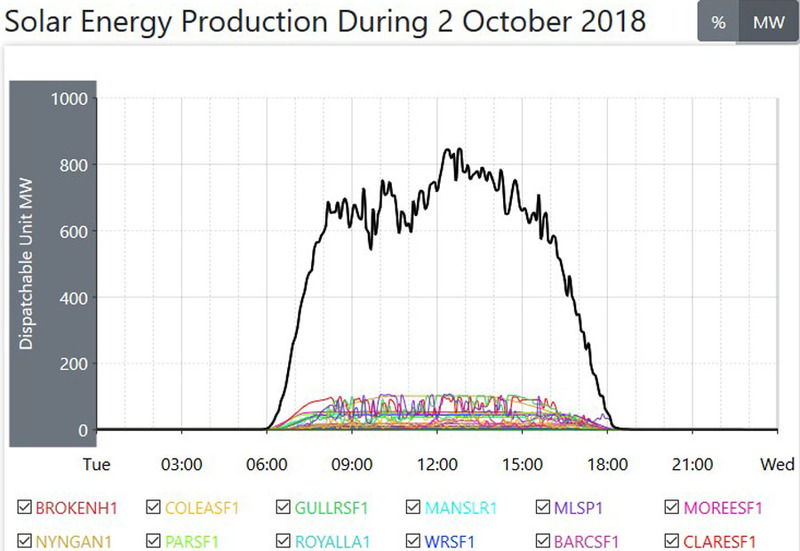 To that end, it’s not really surprising to currently see nine Units off line around those three States still with coal fired power. 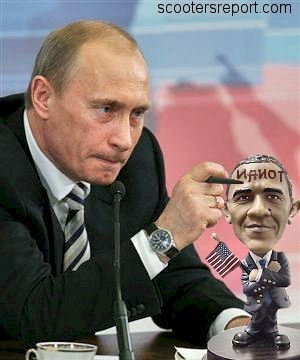 It’s also interesting to watch how that down time is managed. In Queensland for this day, one of those Units which was down, at the Gladstone plant came back up online during the morning, and as it was coming on line, one of the Units at another Queensland plant Millmerran wound down over a period of four to five hours at around the same time. 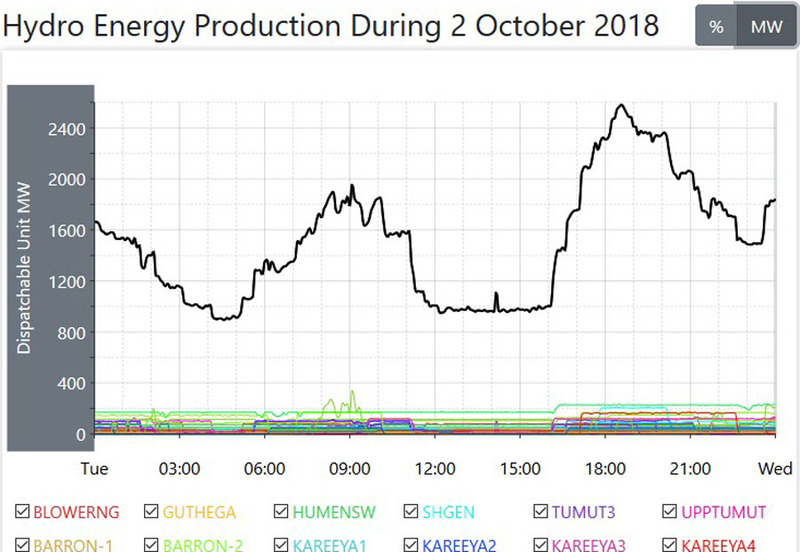 Even so, the average hourly power generation from coal fired power rose by a little more than 1000MW across the Country to an average of 16190MW per hour, and coal fired power supplied around the same percentage as it did for the day before, around 77% of the total. Because overall power consumption is down, that average for Natural Gas fired power is also down, pretty much across the board. 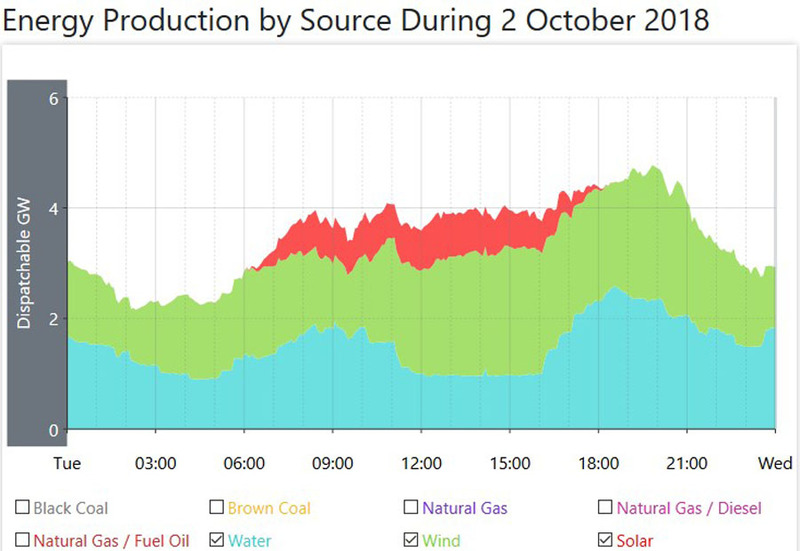 Why run expensive gas plants when those cheap coal fired plants can supply as much as they do? 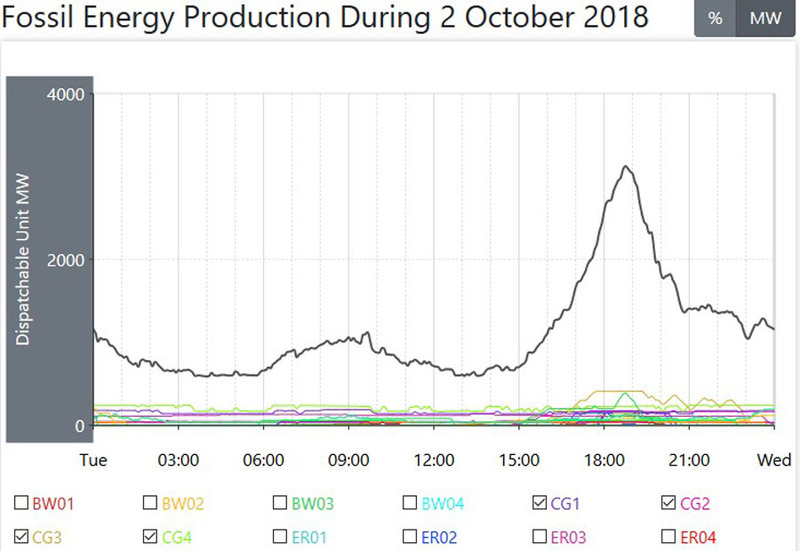 It only rises when needed to cover the evening Peak power consumption, now slowly easing out to around 6.30PM each evening. 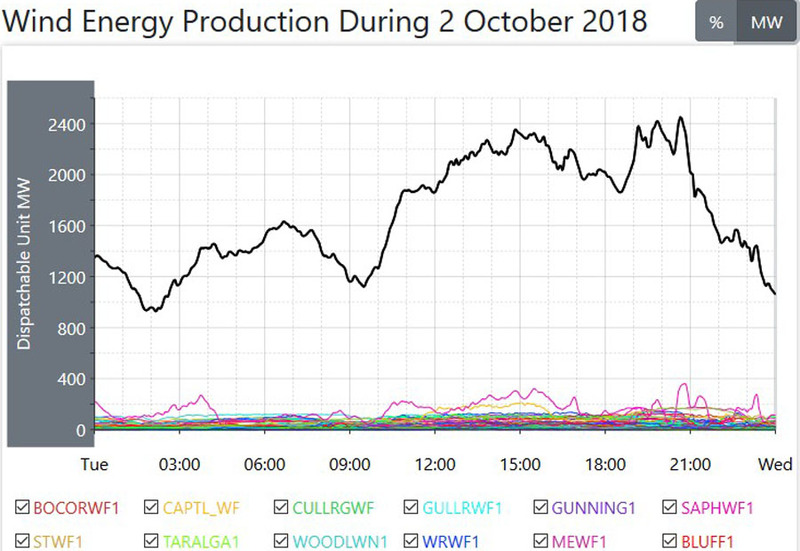 The average for hydro power was slightly down on the day before, mainly because wind power was slightly up on the day. 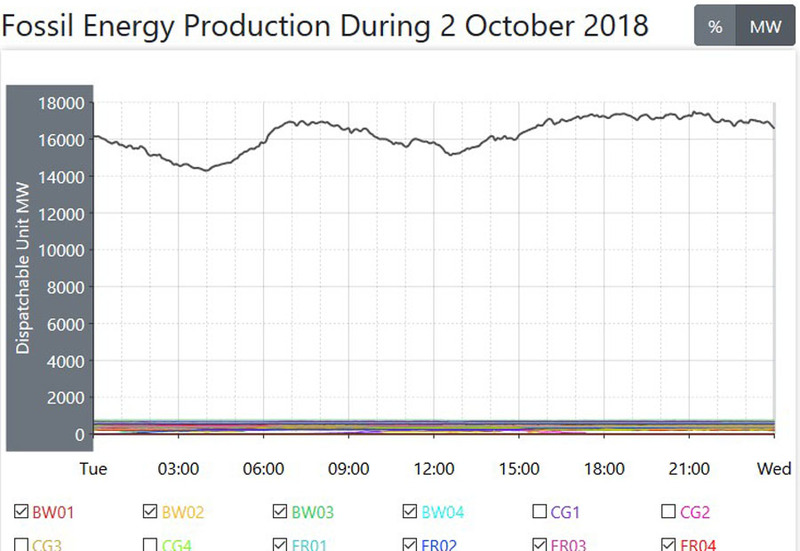 That average for wind power of 1630MW gave wind power a Capacity factor for the day of 30%, pretty much right on its year round average. 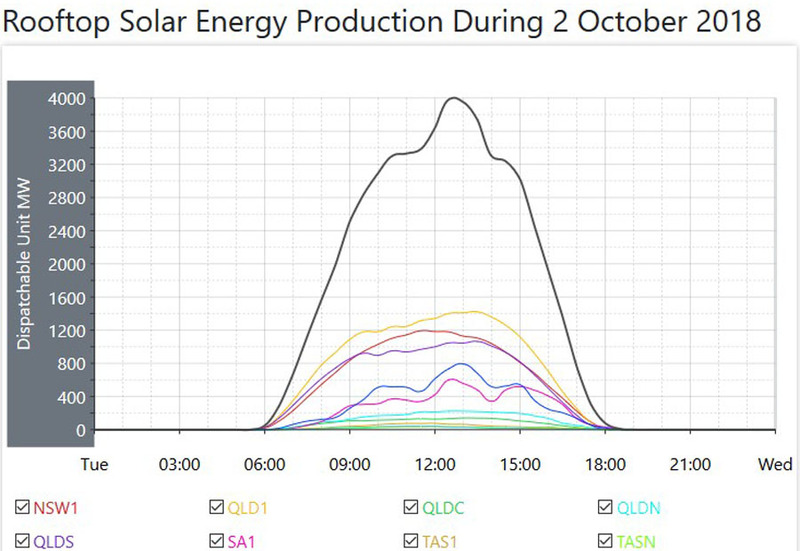 The average for solar power was all but the same for yesterday, still only delivering 1.24% of the power required, and that’s at a Capacity factor of only 16.3%, so all those solar plants still only provide niche levels of power at best, even when they are generating their most power at around Midday. 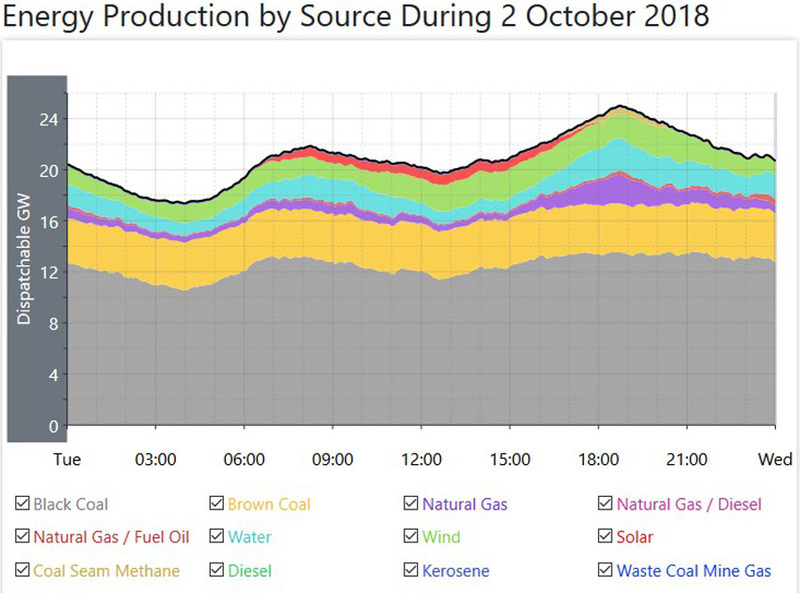 Note also here that the addition I have made to the data, those seven other sources of minor power generation deliver more power than all those solar plants do, and all but one of those is a fossil fuel. The total power delivered from all the renewables, still only comes in at around 16%, so despite the horrendously huge amount of money they have thrown at those renewables of choice, wind power and solar power, they still deliver only marginal amounts of power and the total is enhanced when you include the regular supply of hydro power, because for this day, wind power and solar power combined only managed to deliver 9% of the power being consumed across the Country, with coal fired power delivering 8.6 times the total power, and doing it when it is actually needed.